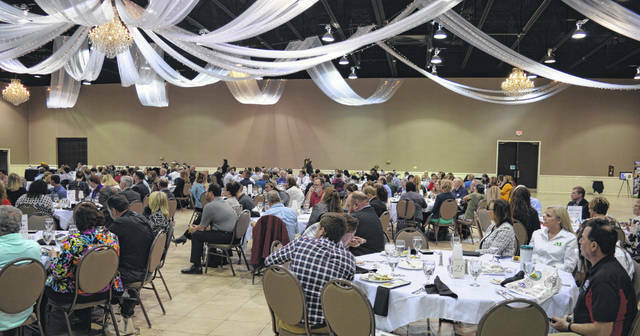 A large crowd attended the annual chamber event held at the Roberts Centre. Some of the many chamber members attending the annual event. 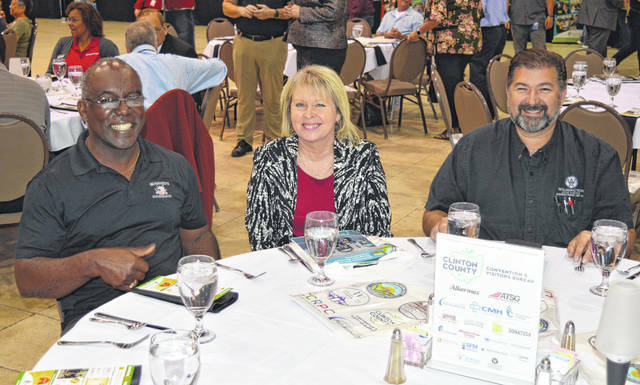 Some of the many chamber members attending the annual event. Laurel Oaks Career Campus students speak to chamber members. 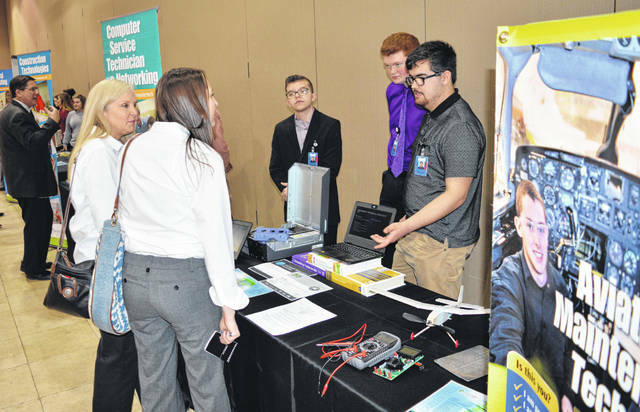 Project Lead the Way Engineering is a satellite partnership between Great Oaks Career Campuses and Wilmington City Schools. 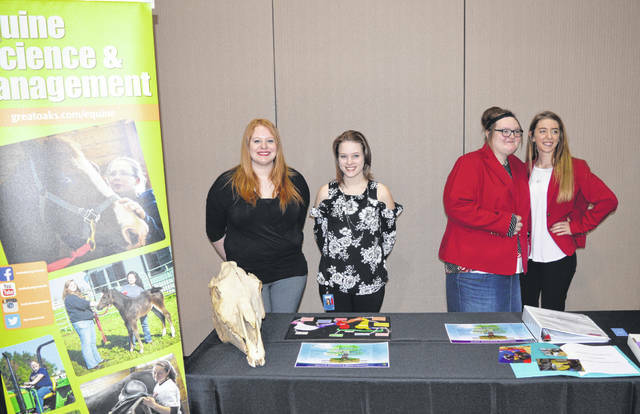 Shown are some of those students at the chamber event. For may more photos, visit wnewsj.com. Some of the many sponsors of the event. Randy Sarvis, left, and Randy Riley. The staff of the Wilmington Public Library’s Main Library and Clinton-Massie branch enjoy the event. 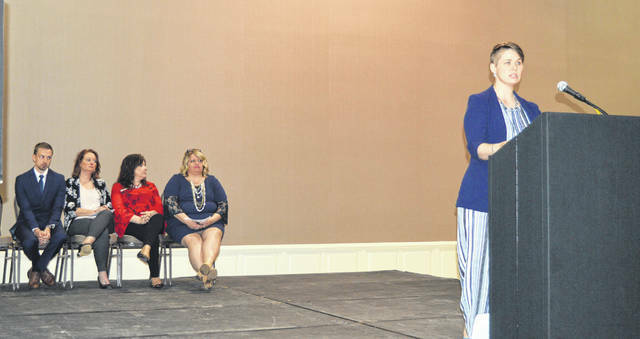 Chamber Executive Director Dessie Rogers, at podium, with chamber staff and, seated at right, CVB Director Susan Valentine-Scott. 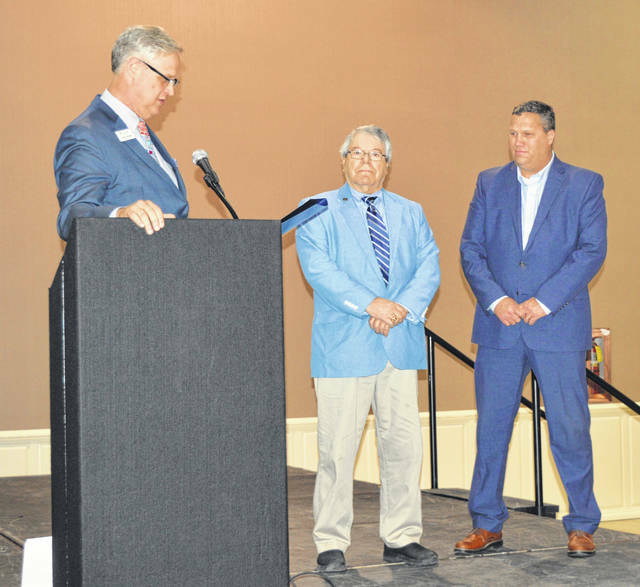 Great Oaks President and CEO Harry Snyder, left, recognizes longtime aviation mechanic and Laurel Oaks adult workforce development program aviation maintenance instructor Gene Kropfelder. At right is Clinton County Commissioner Mike McCarty. 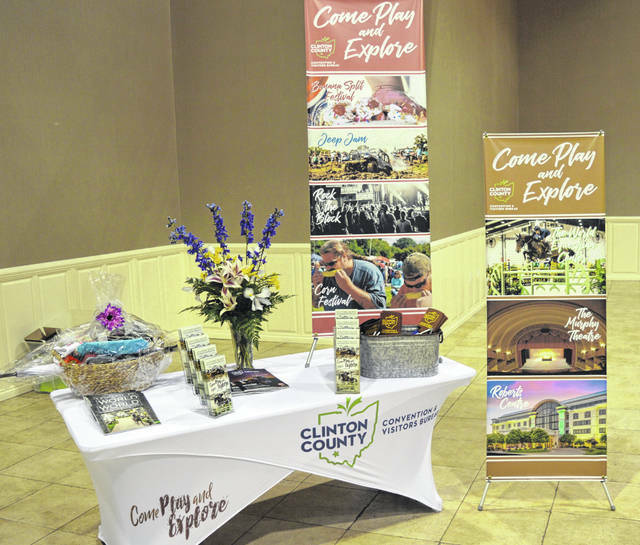 Premium Sponsor of the event was the Clinton County Convention and Visitors Bureau. Great Oaks President and CEO Harry Snyder was keynote speaker. 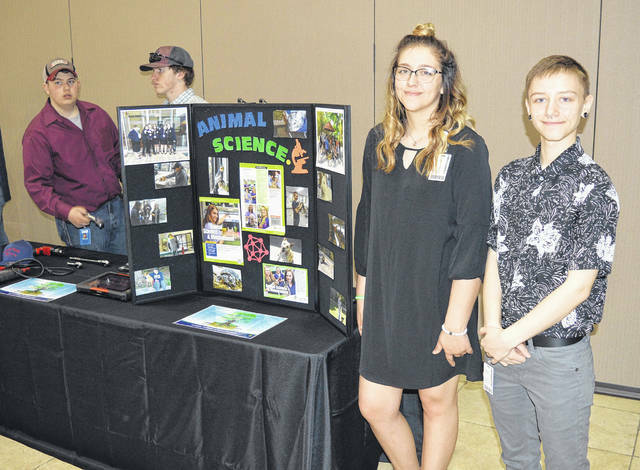 Students from the Laurel Oaks Career Campus played a large role in the annual event. Laurel Oaks Career Campus students speak to chamber members. 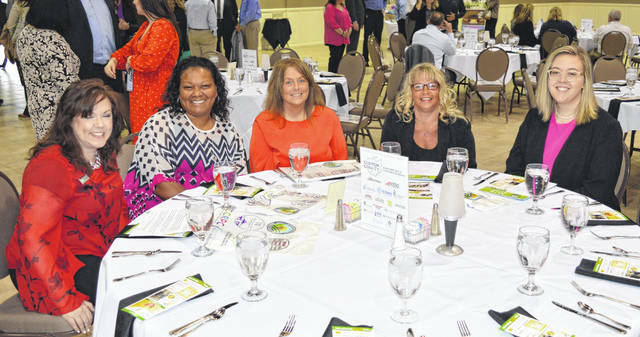 WILMINGTON — Students from Laurel Oaks Career Campus and Wilmington High School would “Lead the Way” and the Great Oaks President and CEO was guest speaker as the Wilmington-Clinton County Chamber of Commerce held its Annual Meeting & Luncheon Friday at the Roberts Centre. Project Lead the Way Engineering is a satellite partnership between Great Oaks Career Campuses and Wilmington City Schools. 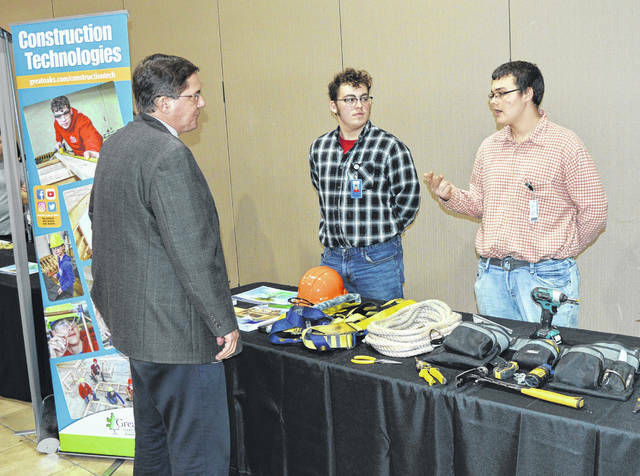 The Wilmington-Clinton County Chamber of Commerce recently hosted a recognition event to honor the first class of four-year senior graduates from the Lead the Way engineering program. These seniors completed courses in Intro to Engineering Design, Principles of Engineering, Digital Electronics, and Aerospace Engineering. The students will further their careers at local colleges and universities and the U.S. Air Force. Students also received a special recognition certificate from U.S. Rep. Steve Stivers. 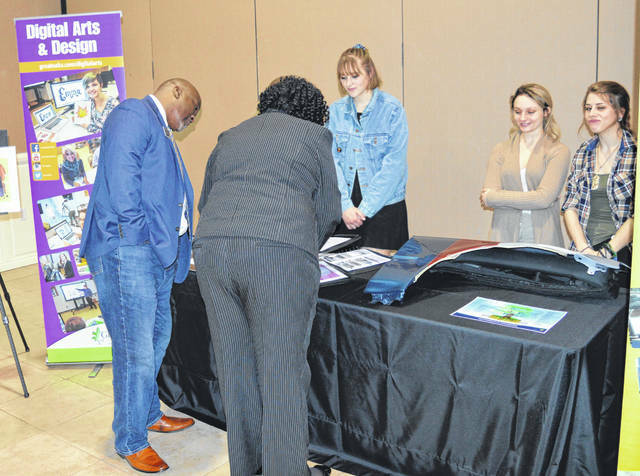 “The Chamber of Commerce is a proud partner of Project Lead the Way, and it was an honor to help recognize these graduating seniors who display the hard work, dedication, and highly skilled technical training that is so crucial to today’s workforce,” Chamber Executive Director Dessie Rogers said recently. 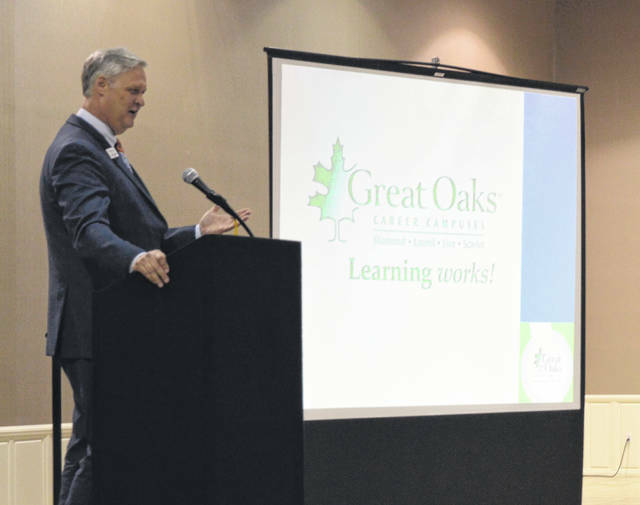 Great Oaks President and CEO Harry Snyder, who has led the way at Great Oaks since 2014, talked about the role of Great Oaks Career Campuses in the community and as a force for economic development. He emphasized the importance of partnerships with business in order to offer high-quality career education and training that prepares graduates for the current and future needs of the regional workforce. 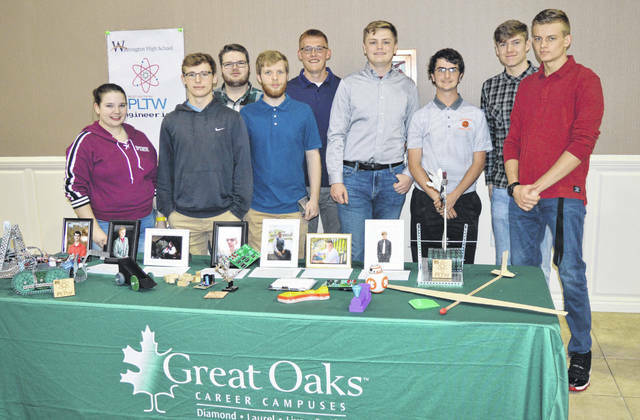 About two dozen Laurel Oaks Career Campus students were in attendance, speaking to chamber members at booths representing their respective programs. 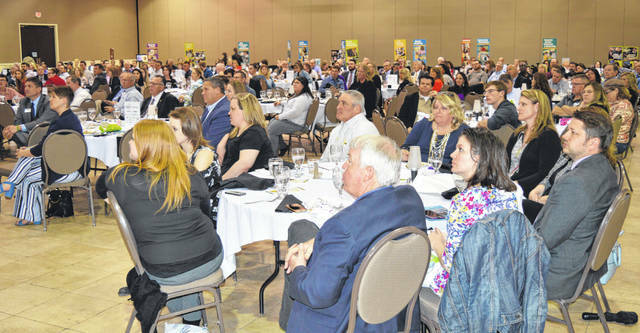 Snyder talked about plans regarding the future of Great Oaks’ fastest-growing campus, Laurel Oaks Career Campus in Wilmington, where a $25-30 million construction and renovation project will begin in June and provide space for students and new programs. 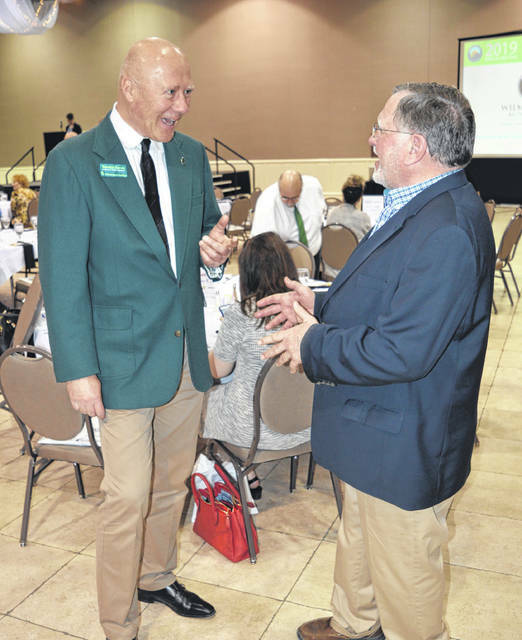 Snyder, a native of Blanchester, said that, five years ago, about 450 high school seniors and juniors attended Laurel Oaks. That has risen to more than 600 students. The new facilities will have a capacity of up to 700 students and provide a campus much simpler to navigate through and better curb appeal. New features will include an identifiable main entrance and newly designed access so nobody has to cross a street with motor vehicle traffic. Snyder said Great Oaks is helping students get an early start, with career exploration programs reaching all the way to fifth-graders. 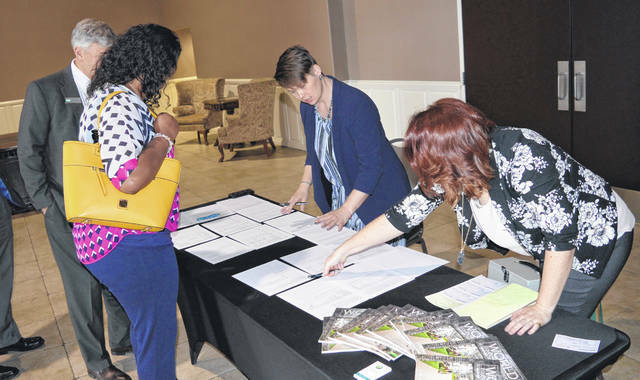 He pointed out statistics that showed how their adult programs bring a huge return on investment to participants. 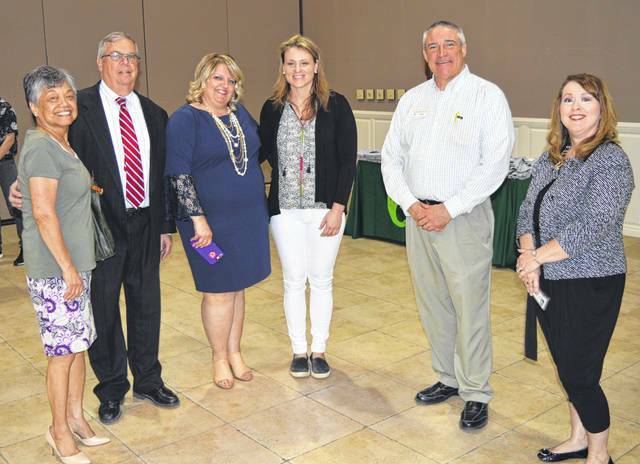 The Wilmington-Clinton County Chamber of Commerce is growing strong, said Chamber Executive Director Dessie Rogers and Marketing and Communications Director Ruth Brindle. Membership is now up to 300, with 49 of those companies and organizations joining since January 2018. 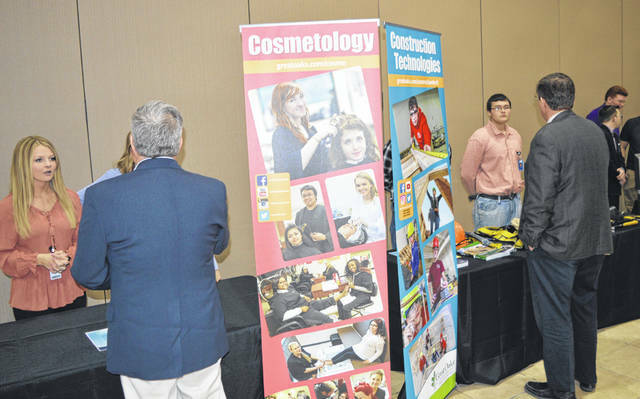 The chamber posted 291 jobs on its website in the past year, with over 29,000 views. The chamber also participated in 40 ribbon cuttings and open houses. The chamber has two new initiatives for its members this year. They already started the Lunch and Learn events. 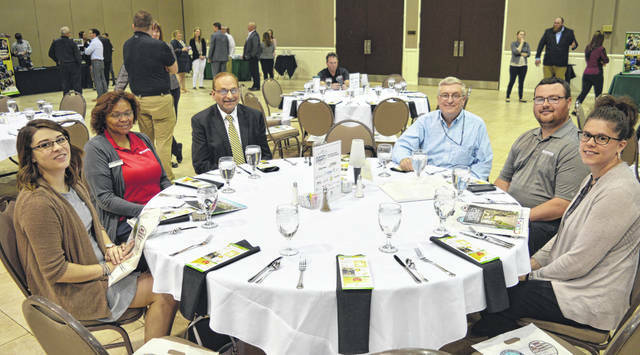 And in November they will begin a Chamber Ambassador Program with the goals of chamber members learning more about each other and mingling more with fellow members. They also promise some fun incentives. 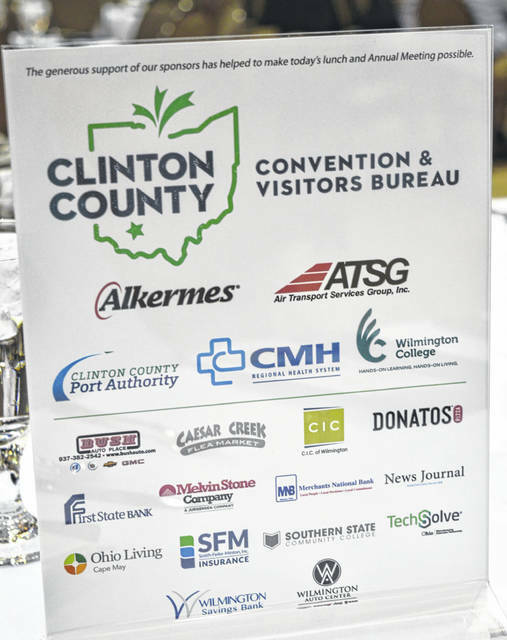 Premium sponsor for the annual chamber event was the Clinton County Convention and Visitors Bureau.